Entropy, the Artist Originals debut from vocalist, musician and producer Sid Sriram, is nothing less than a groundbreaking cultural and artistic convergence—the invention of a new creative space that has no borders. And as with so many musical watersheds, its origin story is that of a supremely gifted young artist who discovers a way to reconcile his divergent roots, with brilliant results. Sid Sriram (28) was born in Chennai and subsequently moved to the San Francisco Bay Area with his family when he was one. This duality of cultural roots has been integral in forming Sriram’s personal and artistic identity. Sid comes from a long lineage of Carnatic (South Indian Classical) musicians with his mother having started a Carnatic vocal music school in Fremont, California in the early 90's. Having noticed Sid's deeply intuitive inclination for music at a very early age, she started teaching him when he was three. He performed on stage for the first time later that year and fell in love with the stage instantly. In 2012, Sid graduated from Berklee College of Music with a degree in Music Production and Engineering. During his time at Berklee, Sid immersed himself in the world of creating records; he honed in on and refined his songwriting, vocal technique and production style. It was during his time at Berklee where he started building his own sonic vision. 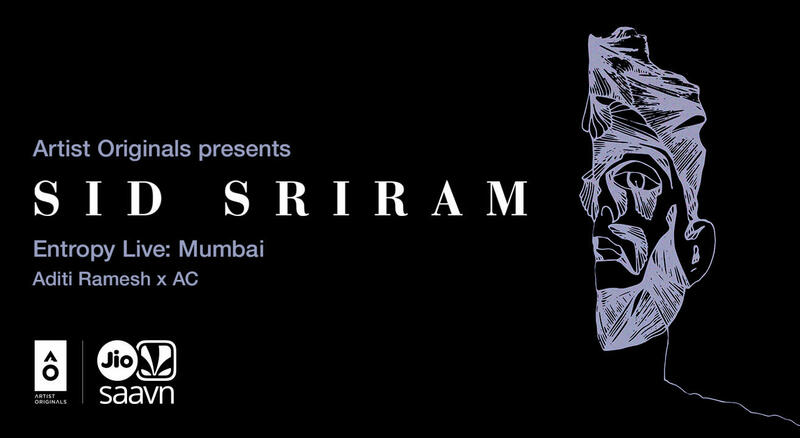 Sid Sriram's music creates a bold cross section where Pop/Soul, his Indian Classical roots and alternative/ambient music clash vibrantly. The Oscar and Grammy Award winning composer AR Rahman gave Sid Sriram his first break in Indian films in late 2012, with the groundbreaking song, “Adiye”. With his work in Indian Cinema soundtrack music resonating with millions, Sriram has developed an exponentially growing fanbase. Aditi Ramesh is an exemplary vocalist, songwriter and producer with a herculean voice complimented by a range of techniques and tonal modulations. Having been inspired by the blues, jazz and traditional carnatic music in which she has been trained in her childhood, her organic exploration into different genres ever since has been a hallmark of her development. Formerly a corporate lawyer at AZB, the top law firm in the country, since quitting in the end of 2016, her musicality has experienced exponential growth in her soundscape, with her performance incorporating electronic drums and live keys, in which she has been classically trained in western music theory for about a decade. As well as her use of her eloquent voice as an instrument, used to create symphonic harmonies and intricate melodies. The context of her music can best be described as using the mundane, as a foundation for depicting the nuanced realities facing everybody on a recurrent basis, while at the same time having a sonic content which provides funky, groovy and melodic resolutions. This sort of a juxtaposition truly exemplifies her perspective of not taking oneself too seriously, as do her frequent and at times inspiring bouts of daydreaming. Also known to hone extraordinary culinary skills, she's a favourite at fleas, integrating her pop ups with exhilarating music performances.